The Loddon Plains Landcare Network along with the Friends of Terrick Terrick National Park hosted a Landcare stall at the Pyramid Hill College fete on the 1st of November 2013. The stall featured many Landcare materials including the Network’s new brochure, weed guides, stickers and fridge magnets. Free trees and native plants were available to families thanks to generous donations from Neangar Nursery and Gannawarra Trees. Thank you to members of the Friends of Terrick Terrick National Park for taking the time to volunteer for the stall. If your group is interested in hosting a stall and would like to display Landcare products please get in contact with our Landcare Facilitator to arrange pick up. 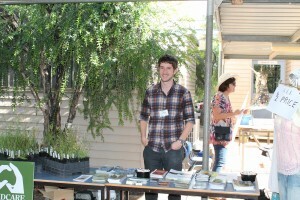 Photo: Anthony Gallacher, Landcare Facilitator hosts the stall at Pyramid Hill College Fete.